The best performing metal this week was platinum, up 0.26 percent as money managers boosted their positions on expectations for higher prices. 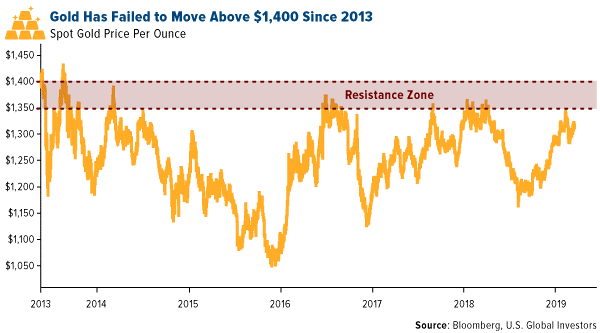 Gold traders remained bullish this week even though the yellow metal tumbled below $1,300 an ounce, according to the weekly Bloomberg survey. Turkey saw its gold reserves rise again, up $331 million from the prior week, according to central bank data. The nation�s reserves are now worth $21 billion as of March 22. Globally, central banks have purchased a whopping 126 tons of gold so far this quarter, the fastest rate since 1971, according to Morgan Stanley. Most of this purchasing has come from China, Russia and Turkey. Russia has been adding to its gold reserves rapidly in an effort to �de-dollarize� and break reliance on the U.S. dollar. Renaissance Capital says that gold buying in Russia has now exceeded its mine supply and the country could soon start to import the metal. Bloomberg reports that the mine that found the world�s largest-ever diamond, a 3,106-carat gem in 1905, has delivered yet another massive treasure. Petra Diamonds� Cullinan mine in South Africa turned up a 425-carat white color Type II stone. Shares of Petra rose over 7 percent on the news, rebounding from a 16-year low. Zimbabwe�s Finance Minister announced that the country plans to ditch rules within two years that requires all businesses to be controlled by black citizens. This is in hopes of attracting foreign investment into the nation, which has the world�s second-largest platinum reserves, plus many other significant mineral deposits. � The worst performing metal this week was palladium, down 10.82 percent as hedge funds cut their positions to a 21-week low. Gold prices saw the largest single-session percentage decline since August on Thursday and landed below the $1,300 per ounce mark for the first time in two weeks, according to MarketWatch. This is partly due to a stronger U.S. dollar, which has rallied in recent days, and due to lower GDP and economic growth forecasts. Lower economic growth can indicate inflation might be lower. � Palladium also took a tumble this week. The metal fell over 5 percent on Wednesday, the most since August, as signs of slowing economic growth created demand worries. This could be a sign that its multi-month rally is over, as it shot up in the last year with the rise in demand for auto catalysts. Or maybe palladium�s fall is due to Russia�s richest man announcing this week that he plans to issue cryptocurrency tokens backed by the metal? � Mongolia passed an amendment doubling its gold royalty rate to 5 percent, which will apply to both mining companies and individual artisanal miners. The amendment is to the Minerals Law that previously set the rate at 2.5 percent. South African mining companies are challenging parts of a government charter saying that it will hinder foreign investment and breaches a court order. The charter is aimed at redistributing South Africa�s mineral wealth. The Gold Field�s board has asked its CEO for other options to get its flagship South Deep mine profitable again, should the fifth restructure in 13 years fail to do the job. The company recently invested $800 million in the South African mine. � UBS raised its six- and 12-month silver price forecasts to $16.30 per ounce on the news that the U.S. Federal Reserve will likely not hike rates this year or next and that its balance sheet reduction may end soon. UBS analysts in a report say that the price of gold would likely pull the white metal as well, as it did late last year, reports Bloomberg. In a pleasant reversal, the Mexican senate halted the advance of a mining initiative that would have allowed the government to cancel concessions. The announcement of that initiative back in November sent shares of the country�s top mining companies plunging. � Johnson Matthey Plc is moving toward the battery-materials space. The company secured a site for a new battery-materials plant in Eastern Europe in a shift toward electric car supply to counter falling demand for its diesel auto-exhaust catalysts, writes Bloomberg. Johnson Matthey said in a statement this week that it has also partnered with Canada�s Nemaska Lithium Inc. to provide the metal for processing in the facility. The government of Ecuador had big plans to boost mining in the nation, but newly elected anti-mine candidates could be a threat to those plans. Ecuador�s deputy mining minister said in a statement this week that �the results of the vote endanger projects of national interest and will probably have legal and investment consequences.� Are you tracking Venezuela�s gold movements? Some of it might have been found in Uganda. AP reports that a gold refinery primarily owned by a Belgian is facing Ugandan sanctions over the questionable importation of 7.4 tons of gold earlier in March that may have originated from South America.